Mayor Pro-tem and Councilmembers wave to the public while standing on their float during the Parade of Oranges at the Texas Citrus Fiesta in Mission. MISSION — Hundreds of residents from the community and surrounding area sat on the sidewalk or on lawn chairs on Conway Avenue here for the 81st anniversary of the Parade of Oranges. 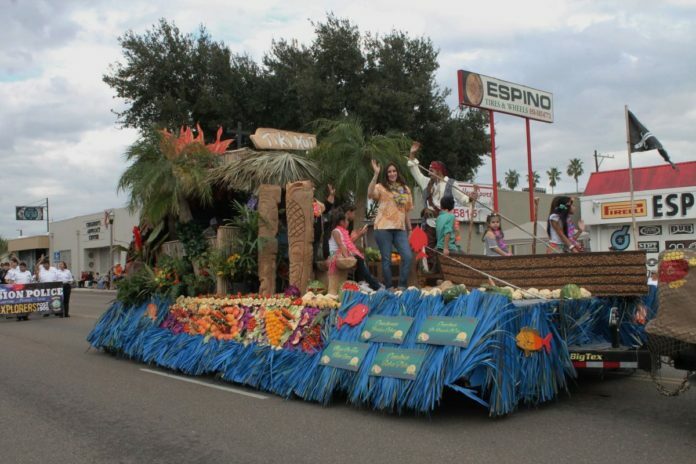 The parade route, which was more than one-mile in distance, was filled with colorful homegrown fruits and vegetables from the Rio Grande Valley. Similar to years past, this year’s parade included a theme — Hawaiian Pirate Adventure. In continuation from the Product Costume Show and the Shoebox Float Competition early in the month, the theme carried over to the Parade of Oranges. The majority of who participated in the parade took advantage of the theme to create the floats. One float used a big ship while others used palm trees as a nod to Hawaii. Some participants wore Hawaiian flower necklaces. Mission resident, Ruby Guerrero was standing on the corner of 11th street and Conway Avenue at 2 p.m. waiting for the parade to start. “I like seeing the different floats,” Ruby said while waiting for the parade to begin. Guerrero attended the parade with her sister, Naomy Briones, and grandmother, Nora Cantu. Another spectator was Mary Ellen Taber of Mission. Taber, a music teacher at Mission CISD’s Bryan Elementary has been attending the parade for several years to see her current and former students participating. “I love it because we’re using citrus and that’s what the whole thing is about,” Taber said. As the parade traveled through the city, people were also invited to Mission Market Square during the day for the fun fair, which included an assortment of foods and other goods, a carnival and live music. The entire celebration dates back to 1932 and consists of events such as a royal reception and the coronation of King Citrus and Queen Citrianna, who were crowned Thursday night.